During the launch of Apple’s third-gen iPad, the company made huge claims about the performance of the new A5x chip, claiming that the A5X processor with quad-core graphics provided up to 4x the graphics performance of NVIDIA’s Tegra 3 chip and 2x the graphics performance of the iPad 2?s A5 chip. 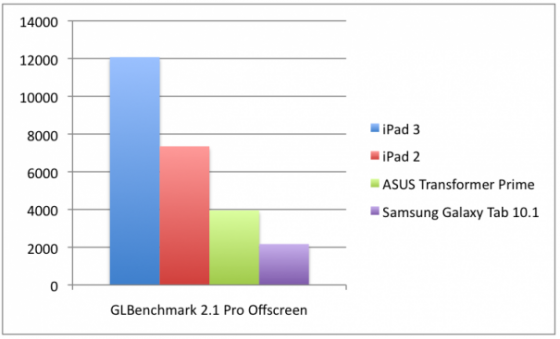 Benchmark data shows the iPad 2?s A5 chip bettering both the A5X and Tegra 3 with the A5X’s improved graphics being used mostly to power the new iPad’s high-resolution Retina display of 3.1 million pixels. However when the Screen is in off mode and benchmarks are run, the results of the A5x significantly prove to outperform all remaining devices. Tegra 3?s quad-core configuration blazes past the dual-core A5X, garnering GeekBench scores of 1540 and 750, respectively. 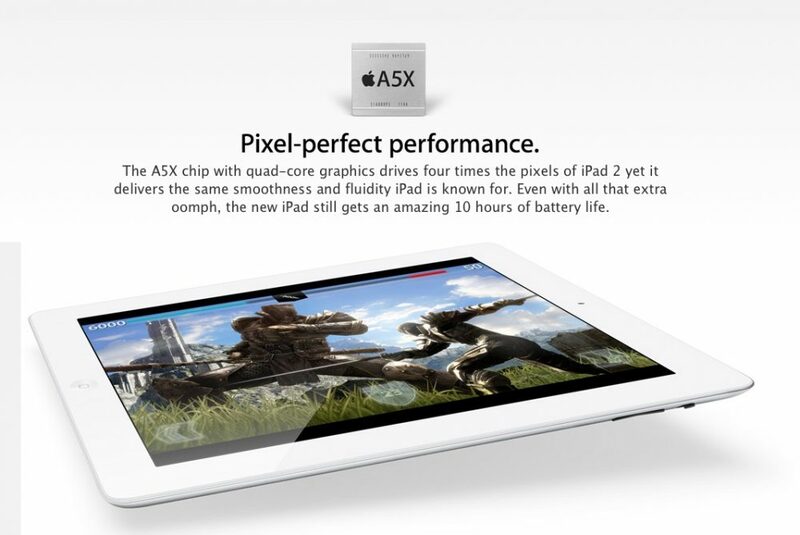 Interestingly, the A5X’s average score fell a few points short of the iPad 2?s standard A5 chip, 753. 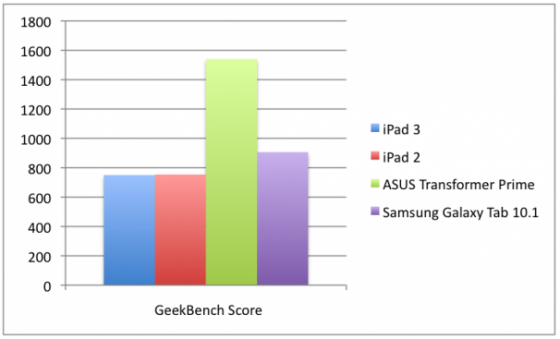 Both the A5X and the A5 also fell shy of the Samsung Galaxy Tab 10.1?s Tegra 2, which received an overall score 905. The gains made by the Tegra 3 are easily chalked up to its two extra cores, but it is also boasts the highest clocking speed of the group at 1.6GHz, compared to the 1GHz clock of the A5X, A5 and Tegra 2. For graphics tests with GLBenchmark, iPad 2 scored higher than the third-gen iPad in both tests. For the Egypt test, the iPad 2 (1024×768) produced 6,709 frames at a framerate of 59 frames-per-second, while the new iPad (2048×1536) ran 5,974 frames at 53 FPS and the Transformer Prime (1280×800) generated 5,955 at a rate of 52 FPS. The Galaxy Tab 10.1 (1280×800), on the other hand, produced only 2,465 frames at a surprisingly low 21 FPS. The results of the off-screen tests show the A5X producing 15,412 frames at a rate of 138 FPS compared to the iPad 2 that has 10,143 frames at 90 FPS.